When some Multi-Level marketing (MLM) companies are accused of being illegal pyramid schemes, their first defense is to say that they have products to sell. They’ll even boast that these are high quality products that justify their often very high prices. But what if they are the same products sold by other currently operating and failed MLMs? Moringa Mountain Trading – major product supplier of MLM companies? 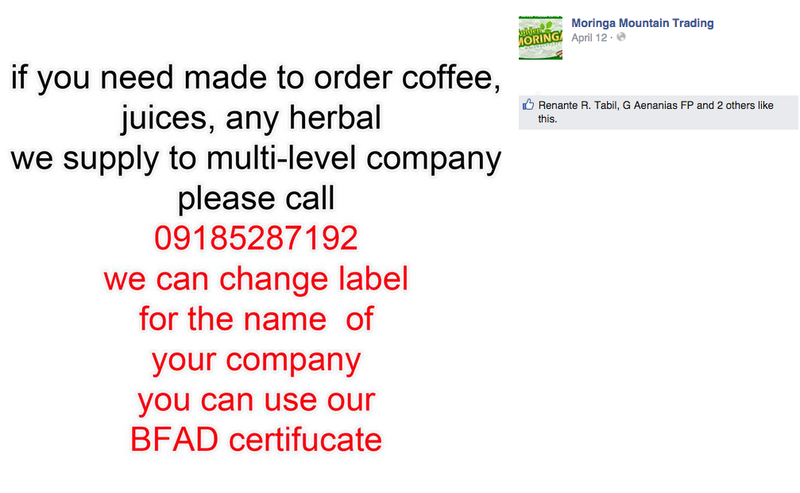 In the Moringa Mountain Trading (MMT) Facebook page, it is apparent that they do business with MLM companies. If you’re putting up your own MLM company (starting your own MLM is where the money is y’all! ), keep this phone number handy. Moringa Mountain Trading Advertisement. Image from MMT Facebook page. Read Moringa Mountain Trading’s Facebook page here. MMT offers a variety of coffee and herbal products. Malunggay, mangosteen, guyabano, ampalaya are just among many ingredients they use for their products. They sell products on their own but they also supply to MLM companies. According to MMT’s FB page, they offer bulk discounts to MLM companies for a minimum 500 bottles order. The MLM company can customize the label. As seen in the image above, the MLM companies can also use MMT’s BFAD certificate. Fun Fact: Moringa is the genus (part of the scientific name) of Malunggay. Success200, an MLM company recently in the news for being the subject of a SEC advisory (see related post here), sells Guyabano capsules for PHP 1,800 per bottle. Since the pay-in for one slot in Success200 is PHP 1,800, this bottle (or something else arbitrarily priced at 1800) is probably what a recruit gets for joining. How much do these capsules actually cost from the supplier? Based on MMT’s Alibaba page, the company supplies these capsules for around USD 10-11 (in the ballpark of of PHP 500) per bottle for worldwide customers. I’ll assume that Philippine based MLM companies can get it for much cheaper. Why did I come up with that conclusion? 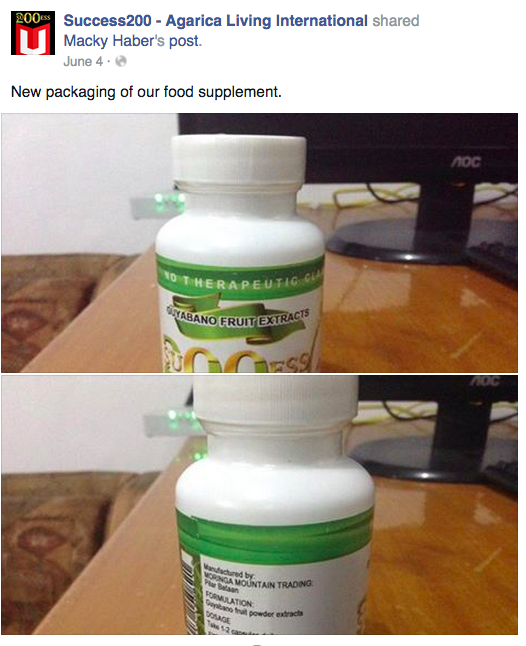 MMT sells its Moringa capsules at PHP 300 retail at its FB page, while it sells the same products at USD 9-10 (ballpark of PHP 450) at wholesale in its Alibaba page. There’s old info (from 2013) on how much the Guyabano capsules retail directly from MMT. One can always call MMT via the phone number in the above image to find out. One thing’s for sure, you can get the exact same product that Success200 sells for much cheaper than PHP 1800. Why is an MLM recruit being asked to pay PHP 1800 in exchange for a product that’s probably only worth around PHP 300-500 retail (much cheaper if bought wholesale by the MLM company)? Could the high remaining amount represent the membership/ entry fee? Read related post here. 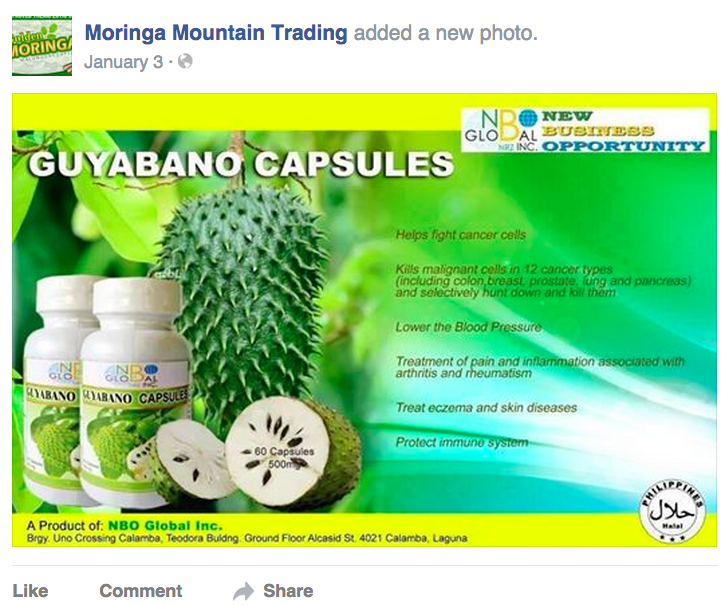 Moringa Mountain Trading made Guyabano capsules for the now collapsed MLM company NBO Global. Are they the same capsules now being sold by Success200? Image from MMT Facebook page. NBO stands for New Business Opportunity. The company started operations late 2013. It even had a grand launching of a its main office in February 2014 (read news here). It started having problems mid 2014. NBO’s head Lorenzo Vargas was arrested on May 2015 (read news here). According to news, NBO stopped paying investors August 2014 and Mr. Vargas went into hiding. NBO Global’s Facebook page has not been updated in 2015. I can’t access their official website. 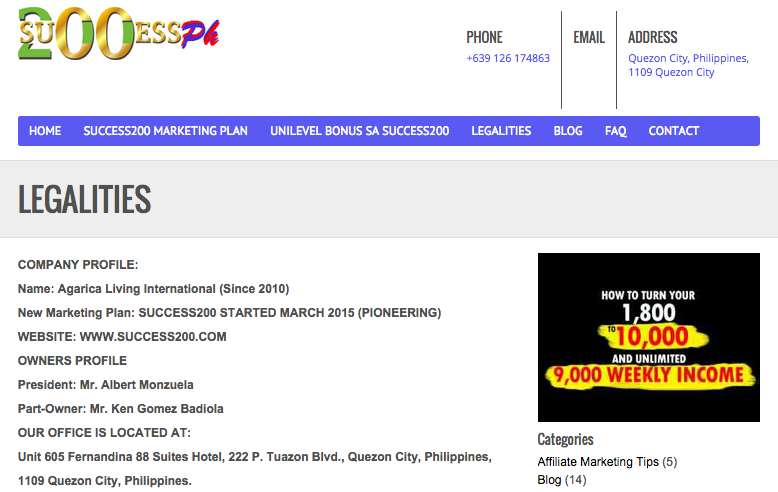 Ken Gomez Badiola and Albert Monzuela, owners of Success200. Image from success200ph.com. From the FB page of one Success200 dealer, it is clarified that Agarica is owned by Monzuela while Success200 is owned by Badiola, the two companies joined forces. 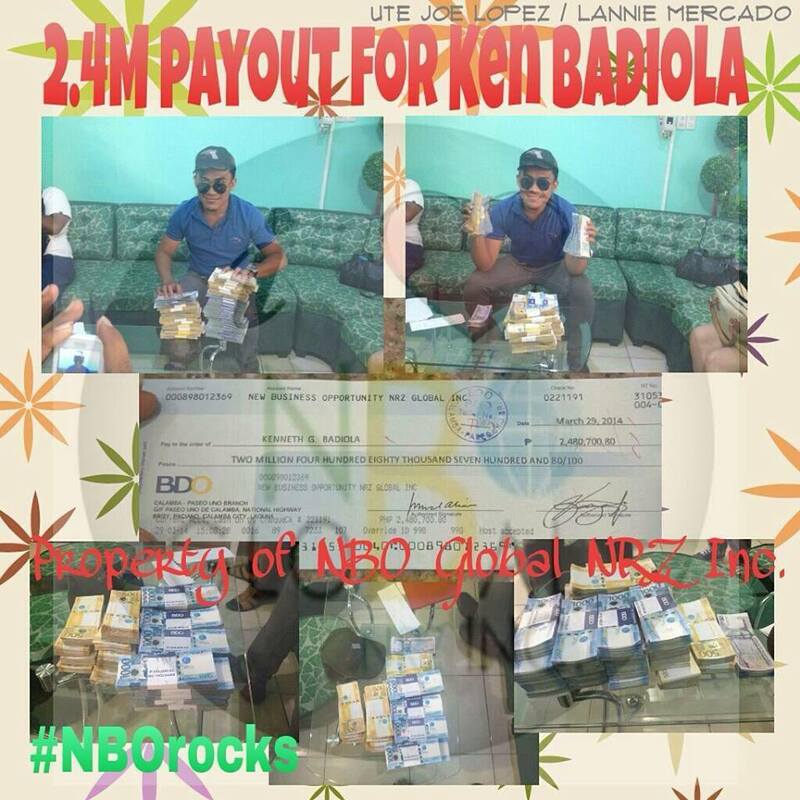 Take note Success200 recruits, Ken’s real full name is Kenneth Gomez Badiola (see the picture of the check he received from NBO Global). That info may come in handy in the future. It is not unusual for a former distributor of an MLM company to start their own MLM company. The scenario with Ken Gomez Badiola is probably one of many similar scenarios. As a member, you think you’re the one making the most money when you exit? The owners of Success200 make more money than you. Success200 earnings per member exit. Image from Success200 – Agarica Living International Facebook page. 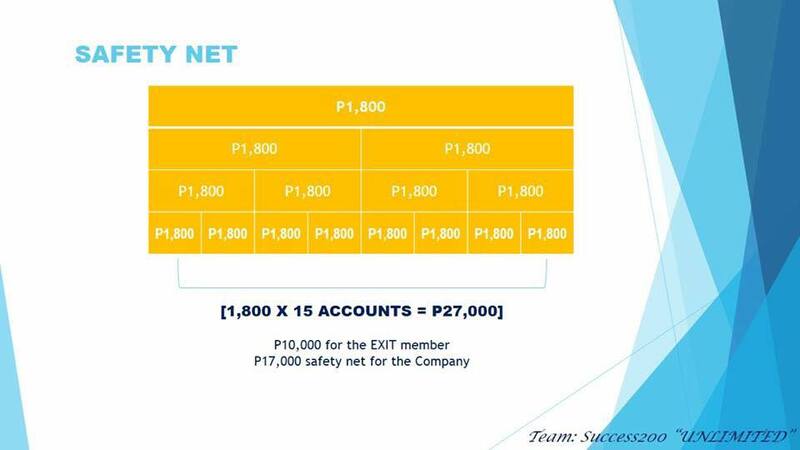 For each member that exits the compensation scheme, the graduating member makes PHP 10,000 (less the 1800 he originally paid out), while the owners make PHP 17,000. Even if you account for the cost of the products handed out (if they are actually given out at all), you still have a lot of money left for the company owners. No wonder Mr. Badiola started his own MLM company. So the next time someone in an MLM orientation tells you that an MLM company was established to help the recruits gain financial freedom, please show them the above image. It is clear who’s making the money. For two gainers (the owner and the exiting member), there are fifteen losers. The statistics are not in your favor. If you’re not the type that want to start his own MLM company (I am not the type either), might as well be a product supplier for MLM companies. There are MLM companies popping up everywhere and they need products to show their recruits to say “we are not a scam because we have products”. Of course, having a product is just one of the many signs of legitimacy. Read related post here. Moringa Mountain Trading had the right idea. The owners saw opportunities and grabbed them. Smart company owners! Are the company owners drinking their own products? If so, maybe those Moringa and Guyabano pills actually work. Wow Ken Badiola! He can replace that ugly green couch with that money. Aside from being a top earner of NBO, Kenneth Badiola also held a position with that of the Monoline Oks company that stopped operation in 2013.